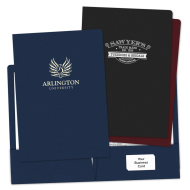 Dress your presentations for success with Custom Legal Size Pocket Folders. 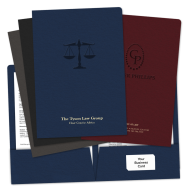 These custom 2-pocket legal size presentation folders are printed in 1-color, 2-color or full-color, and made from our collection of high-quality paper stocks. Also, check out our custom two-pocket folders which are elegantly foil-stamped or embossed. Customized legal-size folders are a fantastic marketing tool. 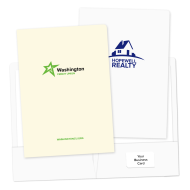 Ideal for presentations, business meetings, and transferring important documents, the addition of your business’s personalized branding is a really great way to distinguish your company from others out there. It shows that your company is both thoughtful and professional and is sure to leave a favorable impression. With a variety of custom folder options, The Mines Press has just what your business needs. When you buy our legal-size presentation folders, you can be sure that you are getting the best quality at the best price!